Can a Hollywood Smile really win you an Oscar? With the results of the Academy Awards to be revealed in Hollywood on Sunday 24th February - Australian teeth whitening specialist White Glo has conducted research to see whether the ‘Hollywood Smile’ is really related to overall success on screen. The analysis by White Glo looked at the last ten years’ Academy Award nominees and recipients across individual acting categories and noted whether they exhibited pearly whites. Blockbuster stars such as Leonardo DiCaprio and Meryl Streep are just two of the award winners able to flash their wonderful white teeth on the red carpet, with an amazing 85% of the total award winners exhibiting what can be termed ‘a Hollywood smile’. By comparison, although plenty of non-winning nominees had winning smiles, 51 of 200 nominees’ had something less than wonderfully white teeth – and ultimately ended-up with less to smile about. Teeth whitening among Hollywood stars has become widespread within the film industry, becoming an essential part of the movie-star image. However, for those wanting to achieve a Hollywood Smile, getting the look needn’t break the bank. White Glo’s in house dental expert Jordan Kirk notes that the extra strength formulation means that you needn’t leave for Los Angeles to achieve a Hollywood Smile. Professional Choice is widely available on the high street and can be applied at home in your own leisure. Get the optimum sparkling white Aussie smile by using White Glo, Australia’s number one-rated whitening toothpaste brand. 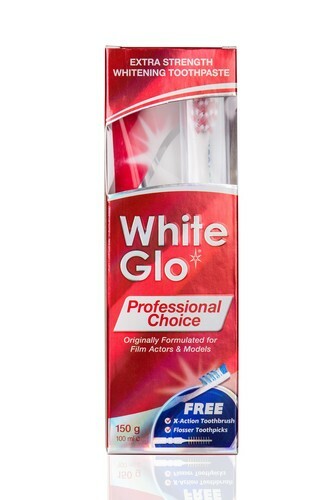 White Glo’s Professional Choice Toothpaste is a premium fluoride-enriched toothpaste that combines white teeth with maximum oral care hygiene. This particular formulation was originally developed for film actors and models – professionals who require utmost facial beautification. Its special Extra Strength formulation lightens discolouration and yellowing on tooth enamel which is often caused by food and drinks with strong colouring. Following its launch, White Glo’s Professional Choice was rated most-effective whitening toothpaste by a leading consumer trial. * With regular use, it will help restore your teeth’s glamourous shine giving you a radiant smile. What’s more, its low-abrasion formula protects cavities making it a safe and suitable treatment for everyday use. Complete your oral hygiene routine by using the free X-Action toothbrush and dental flosser toothpicks available in every pack. Also available is the White Glo Diamond Series Whitening System for dramatic instant results. This lifts and removes years of stains and yellowing on the tooth enamel safely - without abrasion. It's an exclusive peroxide-free whitening system developed by dentists to achieve fast effective results for a smile that shines bright like a diamond. Users simply apply White Glo Diamond Series whitening gel directly on the Instant-Fit Mouth Tray and place the tray in their mouth for 5-15 minutes. Used daily for one week, the Diamond Series Whitening System promises whiter teeth in seven days or your money back. For additional comment or images to accompany this release please contact Amy on amy@kincomms.com or call 020 3958 7085. Samples are available for press. These include: Professional Choice, White Glo Pure and Natural, Smokers Formula, Charcoal Deep Stain Remover, Diamond Series, Coffee and Tea Remover Formula. This press release was distributed by ResponseSource Press Release Wire on behalf of Kin Communications2 in the following categories: Entertainment & Arts, Health, Women's Interest & Beauty, for more information visit https://pressreleasewire.responsesource.com/about.